This is the love part of our LOVE/ HATE series. Love is all we need as well as a home, food, clothes and something to do. Merry christmas friends. Prints for Sale in Nelly Duff. 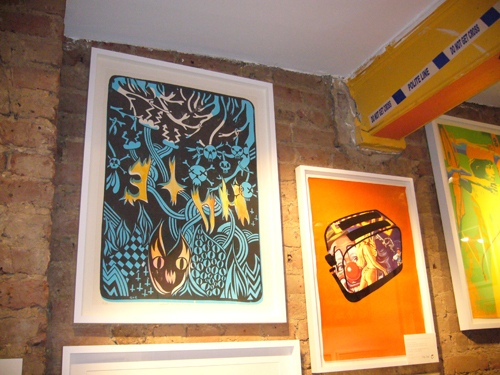 Go to Nelly Duff in Columbia Road, London, to buy our Love/ Hate prints or shop online. For this series of prints Gilles & Cecilie depicts the opposites and attractions in their relationship with each other and their surrounding environment. In this first series LOVE/ HATE each poster illustrates the complexity with the two. Without love there is no hate and vice versa. The love poster is visualising what is above ground and the hate visualise what is below. From the roots of plants down the the flames of hell. The colours of the love posters are babypink for soft romantic days, the green for jealousy and the black frame for constant hard work on keeping a healthy relationship. The colours of the hate posters is a flow of orange, red and yellow to illustrate passion and energy. The original artwork is paper cutouts, hand cut with scalpel to high presicion. This makes a great template for exposing screen. They mix watercolour with silkscreen, hand printed by the artists on Saunders Waterford Watercolour paper, 300 gsm, with deckled edges. 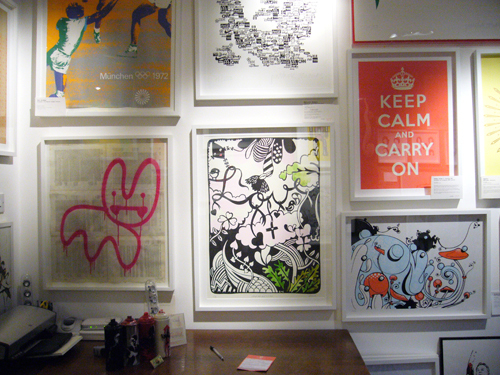 The posters are for sale exclusively from Nelly Duff in Columbia Road, London.